George Greasley, one of the Pacific Northwest's winning Halter trainers, has openings for both the Appaloosa Show Circuit and the AQHA Show Circuit. Horses that have gone through George's stable include: They Call Me Mr., Multiple World and National Champion, Skips Vision, Canadian National Champion, Hesa Smooth Mover, Top 3 at the Canadian National Championships, Make Me Pretty, Top 3 at the Canadian National Championships, Banks Twiceagoer, National Top Ten Year End Award Winner, Skips Vision, Top Ten Year End Award Winner, and Highjackajet, Top Ten National Year End Award Winner. George has also shown many individuals to multiple futurity titles along with ROM titles. George specializes in Halter horses, but is also an Open Show judge as well as a clinician. 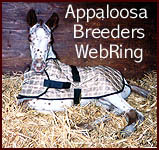 His speciality is putting on clinics for youth and adults, centering on basic Horsemanship; be it showmanship or riding. They have been well attended, with many individuals requesting his return to do further clinics. Although George specializes in halter horses, he knows what is needed to win in performance classes. Having a keen eye for winning looks and movement, he is very capable of locating your next performance or halter horse. If you are looking for a halter or performance horse, consider those listed on this website and/or contact George at the email address listed below. If you like to have a clinic which centers on Basic Horsemanship in your area or need a show judge, please contact George for available times and fees.